Picture this: It’s been a good few years for you and your “project horse,” who you bought three years ago. So far, “Skippy” has far exceeded your expectations. He arrived at your barn an anxious, skinny wreck that had a bad wood-chewing habit — but after several months of turnout, lots of love and some low-key training sessions, he’s turned into a calm, healthy, willing-to-please horse. He also turned out to be an extremely talented jumper that won quite a few of his classes last year. Now you’re ready to move up to the next level of competition. And here’s where it all falls apart. You and Sk​​ippy enter a series of multi-day shows that require considerable travel and Skippy is forced to bed down in many different stalls throughout the season. Turnout is a challenge, but you figure he’s getting plenty of exercise via training, so you don’t worry about it. And at first, he’s fine. But as the season continues, Skippy starts losing weight and his glossy coat turns dull, despite an increased grain ration both morning and night. He starts chewing on his stall doors again, isn’t very interested in food, and seems noticeably displeased to see you arriving with a saddle over your arm. All of that translates to the show ring, where he performs increasingly poorly. So what happened to your keen and talented partner? Chances are, your horse may be dealing with gastritis – most commonly attributed to ulceration of the stomach lining. 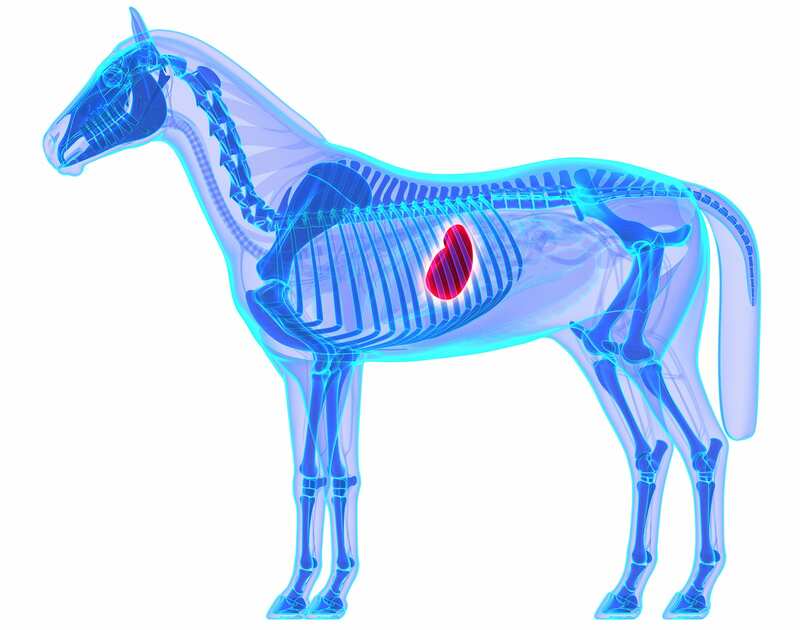 What is Gastritis in Horses? Gastritis is the general term used to describe inflammation and/or irritation of the stomach lining. Gastritis is simply a condition caused by an underlying disease. Based on Skippy’s recent weight loss, lackluster coat and behavior changes — coupled with his new schedule and feeding habits — it seems likely he’s suffering from gastritis (at the very least). Most horse people would simply say that Skippy has a gastric ulcer (a stage of gastritis), a blanket term commonly used to describe lesions in the gastric mucosa (stomach lining). 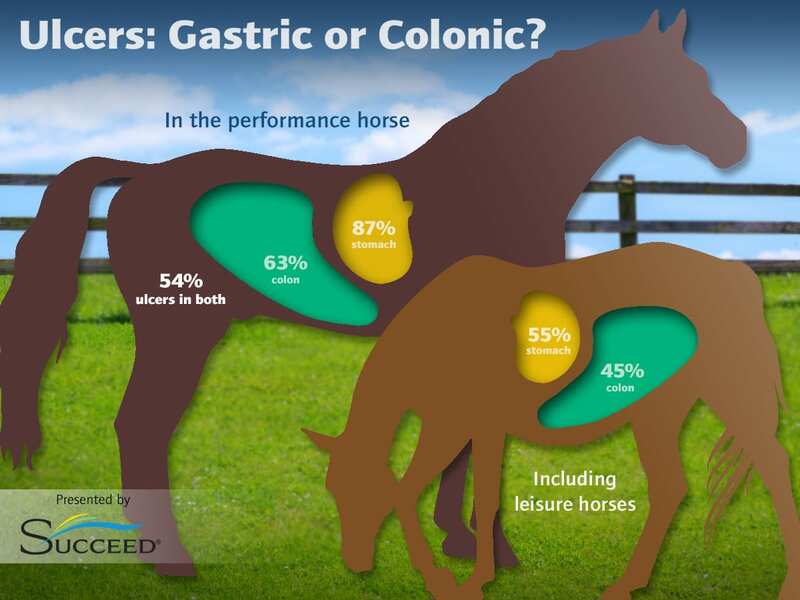 That’s somewhat accurate, as gastritis may be associated with ulcers, a prevalent problem in the performance horse. But what most horse people don’t know is that there are two different kinds of gastric ulcers — and you need treat them differently. Ulcers may affect either the upper squamous region or the lower glandular region of the equine stomach. The regions function very differently, so it’s critical to distinguish between squamous ulceration and glandular ulceration. In order to treat Skippy effectively, it’s important to understand the overall scope of the problem. First, a gastric ulcer isn’t a disease. It simply refers to a lesion or lesions, which, like gastritis, are also part of a syndrome, or a collection of conditions such as the ones Skippy is currently displaying. All of these symptoms can be lumped together under one parent term used to describe ulcers caused by a more specific underlying disease: Equine Gastric Ulcer Syndrome. Most horse people (and particularly those with racehorses or other high-performance horses) are familiar with the concept of gastric ulcers. Many trainers and barn managers keep a tube of omeprazole on hand at all times to suppress the production of gastric acid in a horse they suspect may have gastric ulcers. And sometimes, it helps. But it’s crucial to know what type of ulcer you’re dealing with in order to treat it effectively. The only way to know for sure that your horse is suffering from a gastric ulcer is to have a vet perform a gastroscopy. 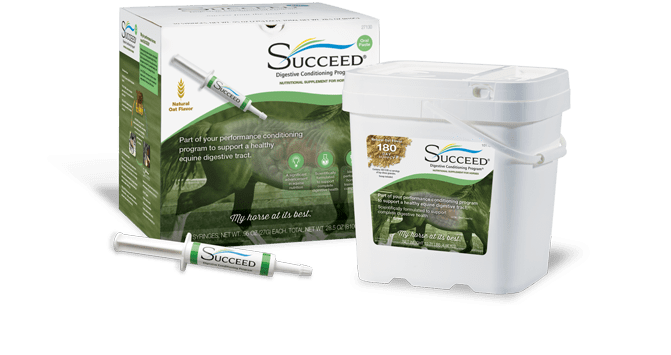 Scoping is the best way for your veterinarian to accurately diagnose the presence and severity of ulceration in the stomach and if conditions allow, proximal duodenum. However, keep in mind there could be additional conditions at play such as parasites or hindgut disease that gastroscopy can’t rule out. Be aware that most vets will recommend a fasting period of at least 12 hours prior to gastroscopy, and may also recommend that you remove water four hours before the procedure as well. Scoping is the best way for your veterinarian to accurately diagnose the presence of gastric ulcers, while keeping in mind there could be additional conditions at play such as parasites or hindgut disease that it doesn’t rule out. the severity of the ulcers. Again, it’s critical to keep in mind that while scoping is effective for confirming the presence of gastric ulcers, it does have limitations and doesn’t rule out other potential gastrointestinal problems. Some ulcers can be difficult to visualize, such as those located at the bottom of the stomach, and it tells you nothing about the health of the horse’s vast hindgut. Investigating both gastric and hindgut conditions is the only way to achieve a complete evaluation of the health of your horse’s gastrointestinal tract. 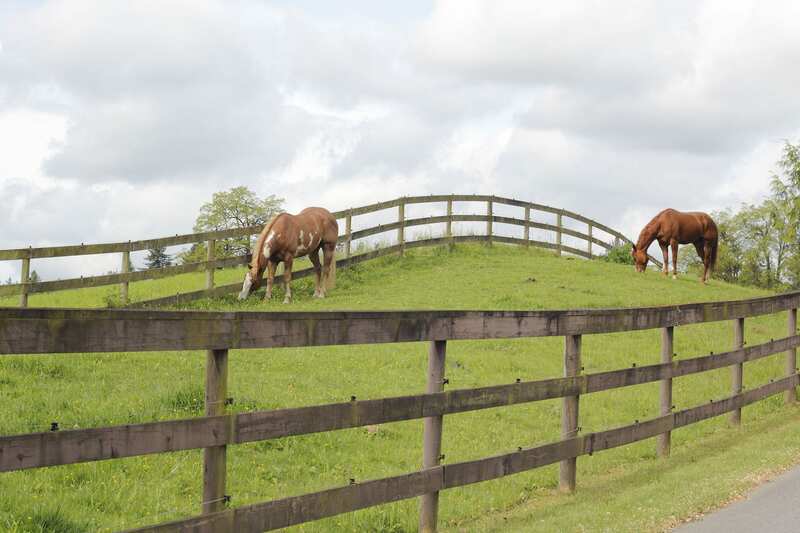 Equine Squamous Gastric Ulcer Syndrome refers to ulcerative lesions specifically affecting the squamous portion of the equine stomach, or roughly, the upper third of the stomach. An ulcer in the squamous region is believed to occur when the mucosal lining becomes damaged, likely by bacteria, parasites or a constant barrage of stomach acid. The squamous region is particularly susceptible to damage as it lacks the protective mechanisms of the glandular region to defend its mucosal lining from gastric acid. He’s also displaying all of the classic symptoms, including loss of appetite, difficulty maintaining weight/weight loss, changes in hair coat, poor behavior, underperformance and wood chewing. If he is suffering from ESGUS, continuing his high-concentrate, low-roughage diet and intensive training schedule could make matters even worse for him. Glandular gastric ulceration (Equine Glandular Gastric Ulcer Syndrome) occurs less frequently than squamous gastric ulceration, but has been found to be more common than previously thought. The two regions function differently. Unlike the upper third of the stomach which is highly susceptible to damage from stomach acid, the glandular section of the stomach is relatively impervious to it. However, when factors occur which cause the integrity of the mucosal lining to deteriorate, its natural defensive mechanisms to gastric acid are also challenged – leading to the development of inflammation and lesions. Scientists aren’t entirely sure what causes this breakdown. They theorize that high dosages or long-term use of non-steroidal anti-inflammatory drugs (NSAIDs), such as Bute, may reduce the blood supply to the lining and so contribute. It has also been suggested that, similar to human gastric ulceration, a bacterial infection may also be at play. Despite ongoing investigation, though, that theory has yet to be confirmed. Again, the symptoms of EGGUS are consistent with Skippy’s symptoms — and also with those of ESGUS. But because EGGUS doesn’t respond to the same treatment methods as ESGUS, you can’t simply dose a horse up with omeprazole and assume he’ll recover. Once an endoscopy has determined whether your horse has ESGUS, EGGUS – or both – it’s time for your next test: checking to see if he has colonic ulcers. By now it should be clear that you need to have a vet diagnose not only the presence of gastric ulceration, but the specific type of gastric ulcer or ulcers your horse could be suffering from before you can select an appropriate and effective treatment plan. But guess what: once a gastroscopy has determined whether your horse has ESGUS, EGGUS — or both — it’s time for your next test: checking to see if he has colonic ulcers. Diarrhea, intermittent or acute, and recurrent mild colic episodes signal a clear hindgut problem, and absolutely warrant further investigation to determine if colonic ulcers are present. Although EGGUS, ESGUS and colonic ulcers all may present in similar ways, the treatment for each is different — so it’s critical to know what all you’re dealing with, and how to prevent it in the future. And keep in mind there is no direct correlation between the development of ESGUS, EGGUS, or colonic ulcers – Skippy may have just one or even all three. Despite much study and the high prevalence of stomach ulcers in horses, the definitive reasons why some horses are more susceptible to developing lesions than others is still largely unknown. We do know, however, that squamous and glandular ulcers do seem to develop in response to different risk factors. In particular, commencement of training and management changes, diets high in concentrates and low in roughage, and intensive exercise can result in the development of ulceration in as little as seven days. However, other studies have shown that gastric ulcers can affect horses indiscriminately – including those not in work and even those out at pasture. However, it is important to remember that EGGUS can present regardless of intensity of exercise, or even in a horse that isn’t frequently exercised. Treating Gastric Ulcers in Horse: Is it Squamous or Glandular? You’ll need to work with your vet to come up with a thorough treatment plan for a horse you suspect (or have confirmed) has ulcers of any type. But most vets will prescribe some combination of the following. Omeprazole to suppress production of gastric acid and give the tissue time to heal and prompt the horse to eat (further suppressing the effect of excess stomach acid). Ranitidine or Cimetidine, to help suppress gastric acidity. Mucosal protectants, to form a physical barrier between stomach and acid. Removal of horse from heavy work or competition schedule. Omeprazole, a treatment that suppresses gastric acid production to allow healing to take place, particularly in the squamous region. While it has been shown to be less effective for treating glandular ulcers, most vets still recommend it as an aid for some healing. However, it would likely be prescribed in higher doses for longer and used in tandem with additional treatments. Mucosal protectants, such as sulcrafate or pectin-lecithin. These are recommended for use along with omeprazole to aid healing in glandular ulceration. Antibiotics, because bacteria may be a cause of some EGGUS. A nutritional digestive supplement to support healthy gut structure and function, especially of the hindgut while suppressing stomach acids. As you can tell from the above, it’s hard to pinpoint the exact cause behind any type of ulcer, so it can be tricky to treat. But one thing is clear from the research: horses with limited turnout and a diet high in processed feeds/low in forage are more prone to developing ulcers. Often, these factors correlate with the types of horses in heavy work or experiencing frequent travel and competition. That may also play a role. But the way we feed horses almost definitely affects their likelihood of developing ulcers of any types. As always with health and wellness, prevention is the best medicine. We stress horses’ digestive systems simply by owning them and removing them from their natural environment. Then we further compound the difficulties by riding, traveling, and competing. 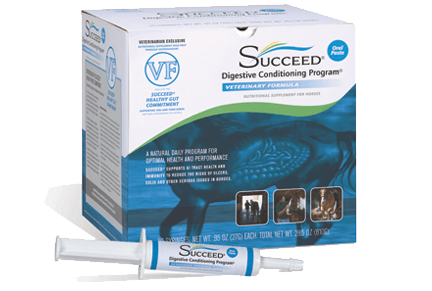 Thus it’s critical, especially for the performance horse, to take as many measures as possible to encourage better digestive health. Minimize the amount of grain (simple carbohydrates) reaching the hindgut, through both moderating the transit rate and enhancing nutrient uptake within the small intestine. This may also reduce the total amount of grain required to maintain body weight and athletic performance. Provide the nutrients to strengthen, repair and replenish the lining of the gut wall (both stomach and hindgut). Help normalize the intestinal flora, eliminating an excess of pathogenic bacteria and subsequent endotoxins they produce. Enhance the immune system for self-repair. Good management and digestive support are essential to both preventing ulcers in horses and aiding recovery when they’ve already occurred. By prioritizing your horse’s digestive health with smart management, you can ensure that Skippy is a member of the healthy performance horse minority who are free of gastric ulcers. While gastric ulcers are one of the most well-recognized conditions of the equine gut, remember that the stomach makes up just 10% of vast, complicated, and delicate digestive system. 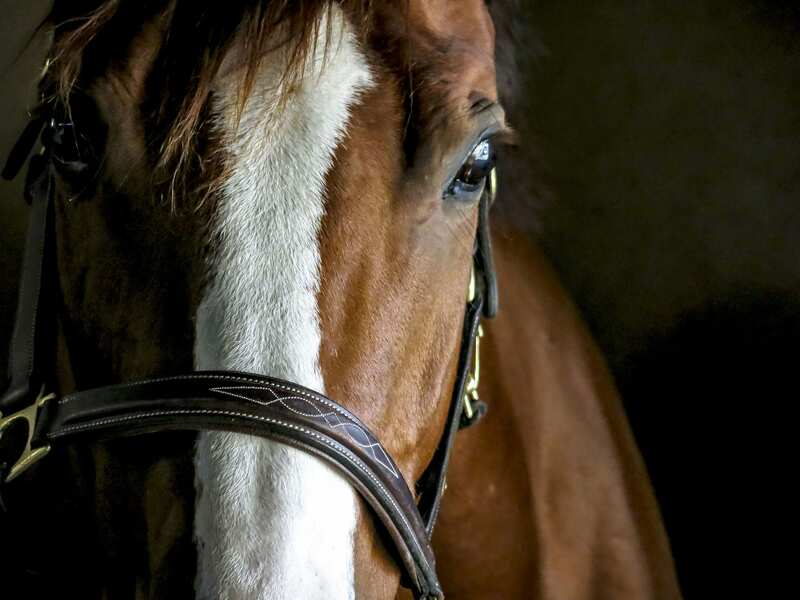 While gastric ulcers are one of the most well-recognized conditions of the equine gut, remember that the stomach makes up just 10% of a vast, complicated, and delicate digestive system. Subscribe to our enewsletter for ongoing education to better understand and manage the digestive health of the horses in your care.